Cecil K. Byrd (1913-1997) was a longtime librarian and faculty member at Indiana University. He served as Curator of Special Collections (1942-1946), Assistant Director of Libraries (1946-1949), Associate Director of Libraries (1949-1964), University Librarian (1964-1972), and finally professor and librarian emeritus at the Lilly Library (1980-1997). Air mail envelope from Cecil K. Byrd’s wartime correspondence with Robert Miller, June 1944. Cecil K. Byrd (M.A. 1938, Ph.D. 1942, History, Indiana University) landed a plum job at IU as Curator of Special Collections upon his graduation, but his career was soon interrupted by the entrance of the United States into World War II. 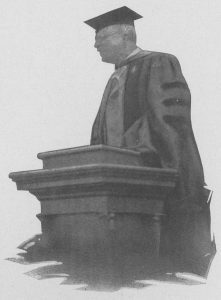 Byrd left the university for service in the U.S. Navy in April 1943, not long after an important IU special collections milestone– the donation of the Oakleaf collection on Abraham Lincoln, which Byrd cataloged, and the opening of the library’s Lincoln room (then located in Franklin Hall). Lincoln Scholars at Lincoln Room Dedication, February 13, 1943. Cecil K. Byrd is the second from the right. After the war, Byrd returned to his beloved library, complete with a brand-new title: Assistant Director of the Libraries. And the rest is history- the expansion of library collections and branch libraries, the establishment of the Lilly Library as IU’s rare books and special collections repository, etc. etc. Except for Abraham Lincoln’s machine gun. Byrd totally made that up. Read the entirety of Byrd’s June 23, 1944 letter to Miller here, including original handwriting and transcript. 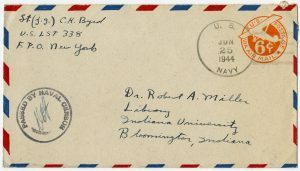 Byrd’s wartime correspondence with Robert Miller is located in the Indiana University Libraries Director’s records, 1932-1977, Collection C540, Indiana University Archives, Bloomington. Tomorrow (June 7th) would be former IU President and Chancellor Herman B Wells’ 115th birthday! To celebrate, visit the Wells Library tomorrow between 12-2pm for a piece of cake on the big day. Also if you’d like to make Hermie’s favorite dessert in the comfort of your own home, see the recipe below! 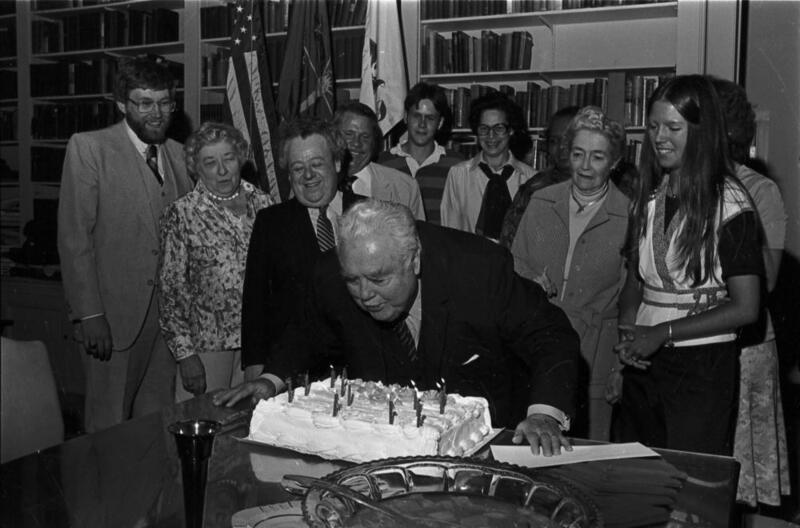 76th Birthday Party for Herman B Wells, June 8, 1978. This culinary masterpiece involves a LOT of fruit and whipped cream and makes a pretty generously-sized cake, so scaling down the recipe is definitely recommended! Mix cake mix and 2/3 lb. water on low speed. 2 mins. Scrape down and mix with 2/3 cups more water on medium speed. 2 mins. Add last 2/3 cups water, oil, mix medium speed 2 mins. Bake 375 for about 30 mins. Cool and chill. Split cake in half. Spread top of split layer with whipped cream. Cut bananas and place on top of whipped cream. Spread more whipped cream on top of bananas. Layer strawberries over that layer. Spread more whipped cream on top of berries. Place other half of cake on top and spread more whipped cream on top of that. Chill before slicing. After 110 years of existence, the IU Student Building is being renamed in honor of Frances Morgan Swain (Miller). But wait, what’s so special about this lady? 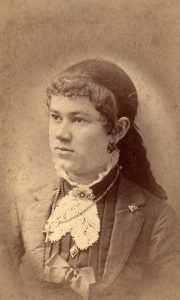 Frances Morgan Swain, circa 1887-1889. Note her pins from Phi Gamma Delta fraternity and Kappa Alpha Theta sorority. Frances “Fannie” Hannah Morgan was born in Knightstown, Indiana, in 1860. Her family appears to have been reasonably well-off (her father, Charles D. Morgan was, by turns, a lawyer, banker, and state representative), and they were members of the Fall Creek Monthly Meeting of Friends in Henry County. 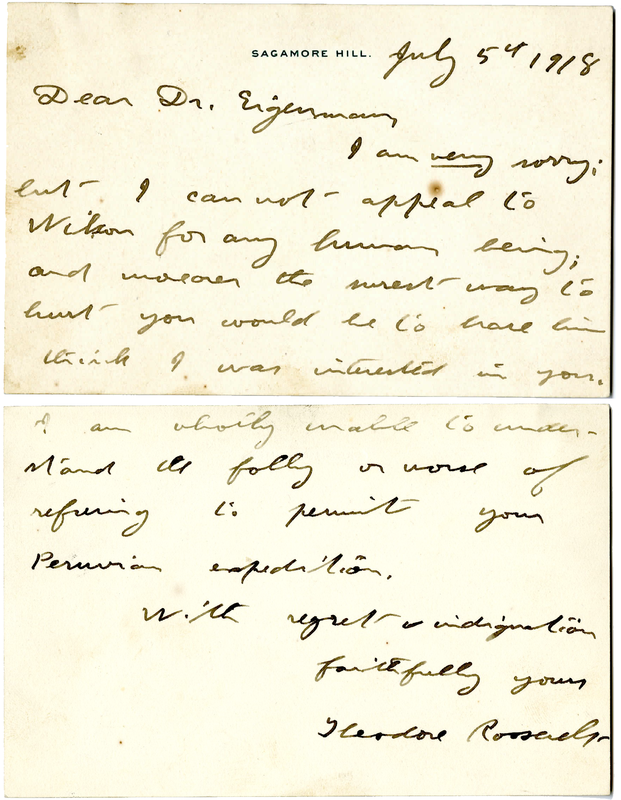 It is unclear when Frances met Joseph Swain, who was by turns a student (B.L.1883, M.S. 1885), professor of mathematics (1887-1891), and president (1893-1902) of Indiana University. One account by the Bloomington Courier stated that they met as students at Indiana, but there is no record of Frances’s attendance before 1887. What is certain is that they were married in September 1885, presumably after connecting over their joint Quaker heritage. And love of mathematics. Keep reading–you’ll see. Compared to the women who preceded her as “first lady” of Indiana University, Frances was hardly the conventional president’s wife. Unlike her predecessors, she actually attended Indiana University, completing junior-level mathematics coursework over two years. She began her studies in 1887, the same year that Joseph was appointed an associate professor in the department. Even more unusual was that she did so as a married woman. She began studying in 1887, the same year that Meadie Hawkins Evermann became IU’s first married female graduate. Swain’s education took a detour when her husband was invited to join the faculty of the newly formed Stanford University in 1891–she completed her A.B. in Mathematics there in 1893. Perhaps the most significant difference between Frances and her predecessors was her public and active commitment to effecting change on campus. When the Swains returned to Bloomington, Joseph as the new university president, Frances completed some graduate-level mathematics coursework, but soon turned her interests to the welfare of students, especially women, at the university. The historian Thomas Clark describes President Swain’s era at IU as one of rapidly increasing enrollments, which proved particularly challenging in the area of housing for female students–there was no women’s dormitory at the time, and private housing options in town were limited. Women arrived on campus from “strict homes…bound down by admonitions, taboos, and inhibitions,” and there were few means of support beyond sororities to “safely” navigate their new environment. Frances’s answer to the problem was the organization of a “Women’s League” dedicated to the self-improvement of its members as well as improving conditions for women on campus and in the Bloomington community. The officers of the IU Women’s League, as pictured in the 1896 Arbutus. Frances Morgan Swain is looking straight ahead in the center of the group. 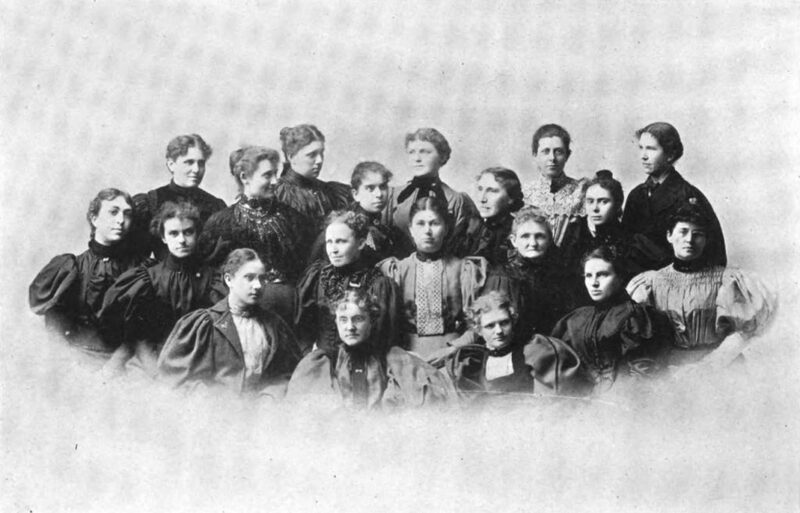 Founded in 1895, the IU Women’s League was composed of women serving in various capacities on campus, including faculty, wives of faculty, members of campus clubs and sororities, and “unrepresented” female students–students who did not belong to a sorority or other club that provided housing or a support system. It provided educational and social programming for league members and the broader campus and Bloomington communities, including lectures, receptions, and dramatic performances. 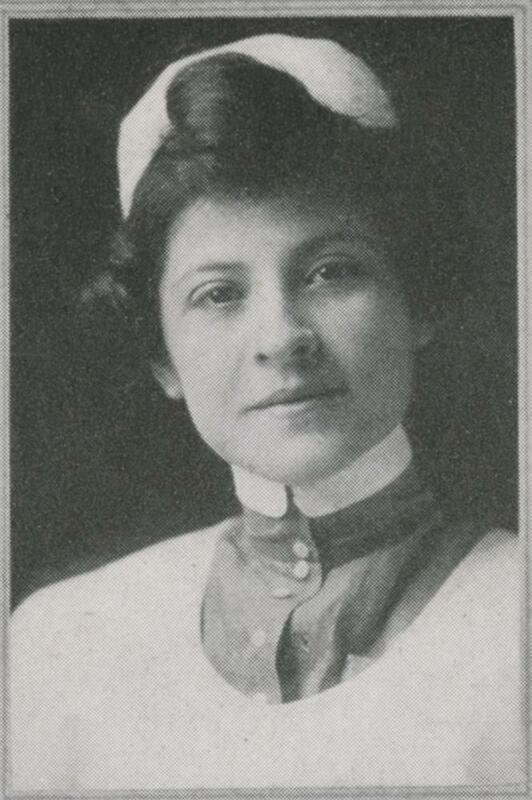 One of the League’s first speakers was Dr. Rebecca Rogers George, an Indianapolis physician who became a longtime, non-resident lecturer on female physiology and hygiene for the university. Over the years a variety of other speakers, including female educators, social reformers, and suffragists discussed current events and other topics of interest. Over time the mission of the Women’s League evolved, transitioning from a social club to a form of women’s student government. Be it resolved, that the Trustees of the University most heartily endorsed the movement, presented and explained by Mrs. Swain, for the erection of a Women’s Building on the campus, and inasmuch as said building is to be erected entirely by private subscription, all friends of the University and of education generally are urged to aid Mrs. Swain and her association in their good work. The campaign for the Women’s Building, essentially the first mass fundraising appeal by the university, ultimately found success through a generous matching donation offer by John D. Rockefeller. 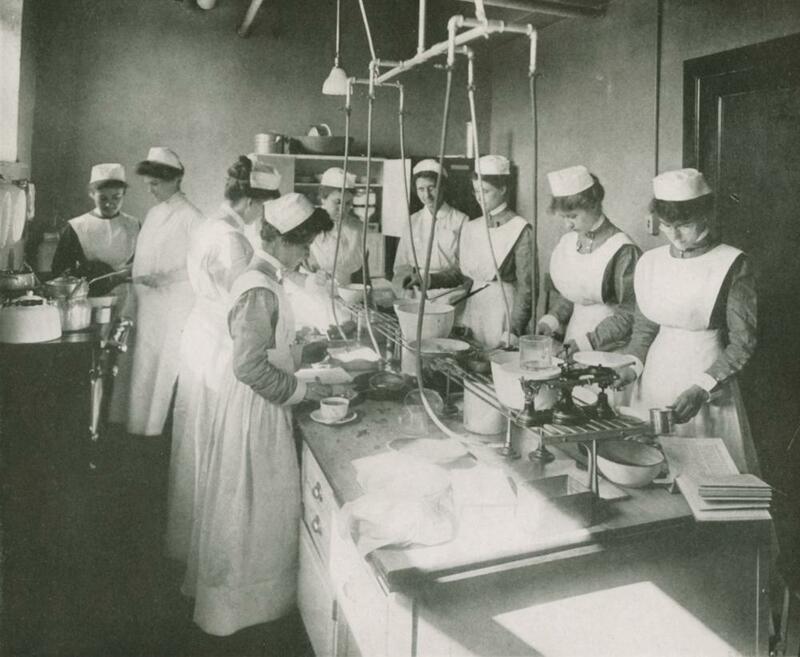 Sacrificed in the process, however, was the building’s status as a facility exclusively for women–it instead was built as the “Student Building,” and has remained so up until this week. The Swains left Indiana when Joseph accepted the presidency of Swarthmore College in Pennsylvania. While the couple were doubtless as happy as, well, a pair of Quakers at a school for Quakers, their interest in the welfare of Hoosier Nation never ceased. 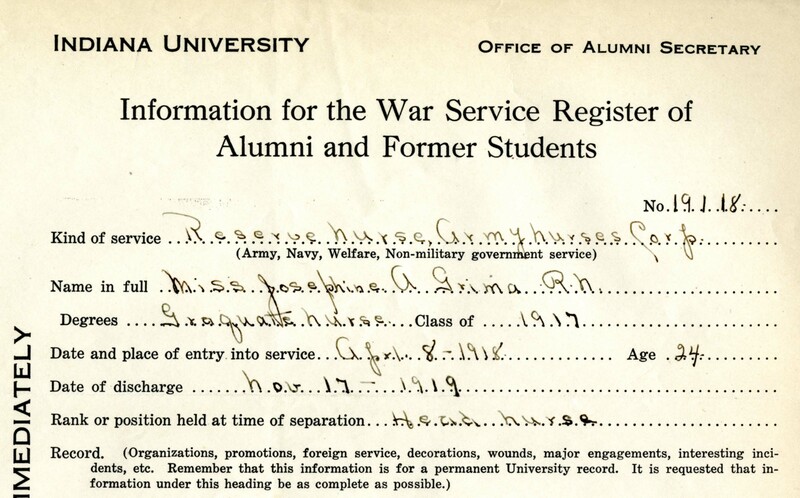 Besides returning to campus for personal visits and university ceremonies, Frances and Joseph were the first donors to the post-World War I Memorial Fund, giving $500 each in 1921 and lobbying alumni to donate as well. In 1932, five years after Joseph died, Frances married John A. Miller, also a former faculty member of Indiana, Stanford, and Swarthmore. And a mathematics professor–see what I mean? But in Bloomington, she’ll always be remembered the most as Mrs. Joseph Swain. As the existence of the Women’s League demonstrates, Frances Swain was not the only woman involved in promoting change on campus. The mere existence of women faculty and staff, however few, surely made a difference to the women who followed them. It is easy to overlook the legacy of women of Frances Morgan Swain’s era, when gendered social norms and expectations limited the ways they could participate in public life. The renaming of the Student Building this week is an important step to make sure they are not forgotten.